I just found out that I didn’t do a fair enough comparison between the MATLAB built-in normxcorr2 function and the pre-compiled normxcorr2_mex in the previous post. The reason is that MATLAB is calculating the full normalized cross-correlation, while the pre-compiled MEX file only calculates the values for the “valid” region of the cross correlation. The idea of calculating only the “valid” region assumes that the feature/template that you are looking for is WITHIN the larger image. 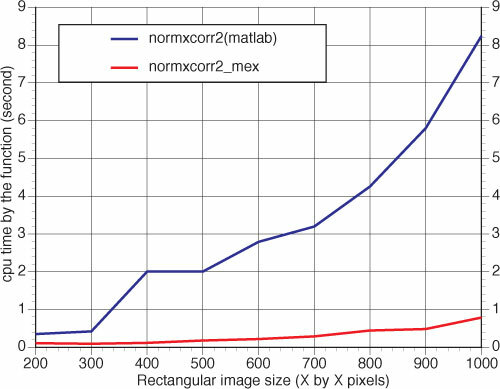 If the feature has several pixels sticking out of the larger image, this assumption will make the normxcorr_mex to give the wrong peak position. I was trying to compile the fast Normalized Cross-correlation function from Daniel Eaton, when I encountered compilation errors on my PowerMac G5. It took me some time to figure out a solution, so I thought it might be useful to other people who want to use Intel s Open Computer Vision library in MATLAB on Mac OS X Tiger. Follow Christoph Seibert’s guide to compile OpenCV on Mac OS X Tiger. You will need Fink installed (use FinkCommander), as well as Apple XCode and X11. Open an X11 Terminal window and type in the following command to set up the environment for pkg-config. Or you can add this line to your .bash_profile file. and choose the default gcc option (# 2). replace the CC line with the following line and save the file. Apple might release Intel-based systems as early as Jan 2006! The rumor (AppleInsider) has it: Apple could ship the first Intel-based Macs in Jan 2006, almost half a year earlier. The first models could be an iMac or PowerBook with Intel version of Tiger system installed. As the leaked 10.4.3 Developer version of Tiger x86 suggests, most of the softwares will be run smoothly on the new Macs. Using the rosetta technology, even the PowerPC-based programs should still be usable on the new system. one is the long-waited video iPod, which attracts all the attention from the media. the other one is an iMac, with a remote control and build-in iSight, making it essentially a Media Center. According to a CNN news report, last quarter Apple sold 6.5 million iPods! Geez, they are doing pretty well! Wow! Apple released a new line of PowerMac: Two dual-core G5 chips = QUAD processors! This is way cool. But I guess many people would wait for the Intel Macs. With hyperthreading, two dual-core Intel chips would be equal to 8 processors (rumor here)!